Located on the largest lake in Switzerland, Lake Neuchâtel is a unique non-tropical overwater bungalow. The word palafitte refers to ancient dwellings constructed on stakes driven into a lake bed and Hotel Palafitte is a modern take on the concept. Each palafitte has its own terrace and some offer direct lake access. Built in 2002 as part of the Swiss National Exhibition Expo.02, 24 of the 38 units are built on pylons over Lake Neuchâtel, Switzerland’s largest lake, and feature views of the neighboring Alps. Free Wi-Fi, in-room Nespresso coffee machines, plasma screen televisions, and L'Occitane toiletries are just some of the amenities that will make you feel right at home in your five-star palafitte. A movable partition in the bathroom allows you to view the lake from the bathtub, perfect for a cozy bubble bath with a view. If swimming in the lake off the deck of your palafitte isn’t enough to keep you occupied, Hotel Palafitte offers a variety of other activities in the summer. Among them are stand-up paddling, water skiing, canoeing, fishing, and bicycling. 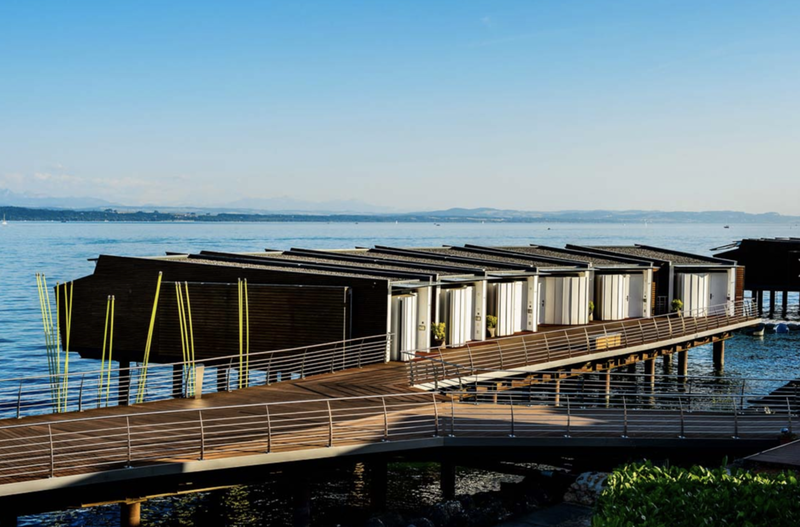 La Table de Palafitte, considered one of the best restaurants in Neuchâtel, features seasonal menus and breathtaking lakeside views. Two star-Michelin chef Sébastien D'Onghia emphasizes regional produce and fresh-from-the-market delicacies. Le Bar offers a cozy mix of barstools and comfy armchairs in front of the fireplace near the hotel’s reception area. Enjoy afternoon tea or post-dinner cocktails, including an authentic absinth fountain. The hotel’s Chasseral room and adjoining terrace can seat up to 48 guests for wedding receptions and up to 80 for cocktail style receptions. Hire out 30 or more rooms and the entire hotel will be given over to you and your wedding guests for the ultimate private event.